In Liverpool? 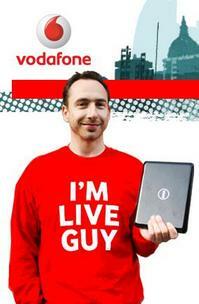 Find our Vodafone LiveGuy! If you’re in the Capital of Culture today, you’re not only probably terribly cultured by now, but you’re in with a chance of winning a netbook! You lucky scousers. All you need to do is follow the clues on his blog, figure out where he’s hiding and collar him, whilst reciting these magic words “You’re LiveGuy and I’m a Vodafone winner!”. The embarrassment you feel at saying this is then instantly ofset by the glee you’ll experience having won a swanky Dell netbook. You can also check out Tech Digest to see how Stylist Brighton got on tracking him round Newcastle. That’s so good to hear – I’m so glad you were a winner!